While we are creatures made by a loving Creator, we are so much more than animals. There is something distinctive and special about a human being compared with the rest of creation. 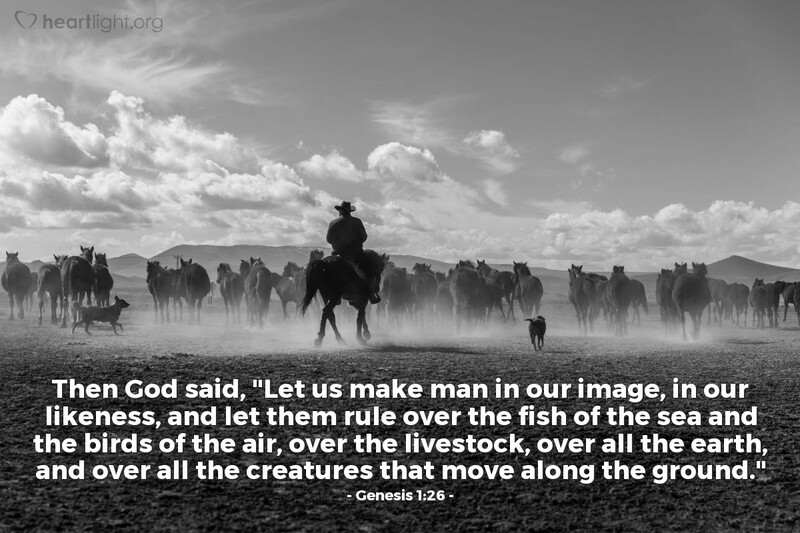 God made us to rule over the animal world. But rule does not mean ruin! Since creation is part of God's testimony to himself (Psalm 19 & Romans 1:20), then we certainly don't want to ruin that testimony. In fact, being made in God's likeness, we want to rule with the grace, benevolence, and care that God himself uses. Father, help me see all the beauty of your creation. Guard me from wastefulness. Guide me into the proper use of the natural resources with which you have so generously blessed me. Most of all, direct my decisions in the way I impact your creation. May my lifestyle and my personal life never damage the beauty of your voice in my world. In Jesus' name I pray. Amen.